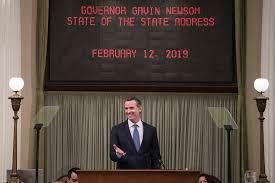 Governor Gavin Mewsom will deliver his first State of the State address today (Tuesday). Meanwhile, Capital Public Radio's PoltiFact reporter Chris NIchols has been keeping an eye on Newsom's early progress on his campaign promises, and has the latest. Governor Gavin Newsom wants to en the California National Guard deployment that former Governor Jerry Brown negotiated with the Trump Administration last year. More from KVCR's Ken Vincent. California Governor Gavin Newsom is making good on a campaign promise to help migrants seeking asylum. KPBS reporter Matt Hoffman has more on Newsom's first visit to San Diego since being sworn in. Groups that advocate for children in California are pressing state lawmakers to fully fund Governor Gavin Newsom’s budget requests to expand access to early learning. KVCR’s Katie Trojano has more. A one-of-a-kind politician has given his final State of the State address: Jerry Brown, California's longest-serving governor and a three-time Democratic presidential candidate. Brown told lawmakers in Sacramento yesterday (Thursday) that California is prospering... and laid out a path for the state to continue its progress. But he also issued dire warnings on a global scale. Capital Public Radio's Ben Adler has this feature report.